A Gwinnett County, Ga., police officer has prompted social media outrage after video of him kicking a handcuffed man in the head went viral. 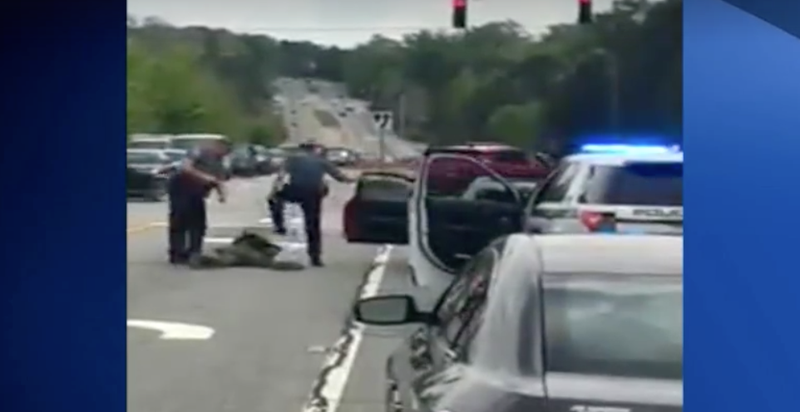 A Gwinnett County Police Department spokesperson called the video “very disturbing” and said that the officer involved has since been placed on administrative leave, the Atlanta Journal-Constitution reports. The incident, which occurred around 4 p.m. Wednesday, was captured on cellphone video by a driver who had stopped a short distance behind what appears to be a traffic stop. In the two-minute video, an officer pulls the driver from his vehicle and drags him to the ground in the middle of the street. The cop is seen gesturing to the driver, who rolls onto his stomach. The cop then appears to handcuff the man with his hands behind his back. Shortly after, another cop is seen running onto the scene, stomping the man—who was looking over his shoulder—in the head. Both officers then struggle with the driver, who is still prone on the ground, and appear to search his pockets. The video ends just as officers place the driver on the trunk of his vehicle. The driver is black, while both officers—who have not been identified—appear to be white. The driver was identified as 21-year-old Demetrius Bryan Hollins. According to AJC, records show that Hollins was booked in the Gwinnett County jail at around 4:45 p.m. Wednesday on charges of possession of less than an ounce of marijuana, obstruction of a police officer and several other traffic citations, including driving on a suspended or revoked license, operating a vehicle with suspended or revoked registration and failure to signal. A mug shot of Hollins shows his nose and lips bloodied. As AJC notes, as of Thursday morning he was still in jail in lieu of a $7,502 bond. “We ... will not idly stand by while assaults are made against black folk in Gwinnett County,” Tillman said. Police spokesperson Cpl. Deon Washington said that a shift commander “initiated an immediate investigation” after becoming aware of the incident. The officer who kicked Hollins, in addition to being placed on leave, was forced to surrender his firearm.